If there is one question that often comes up on social networks, it is that of the choice of the right microphone for one’s handpan. Which microphone to choose? First things first, I wrote a previous article on how to choose a microphone for your handpan. You might want to check it out! 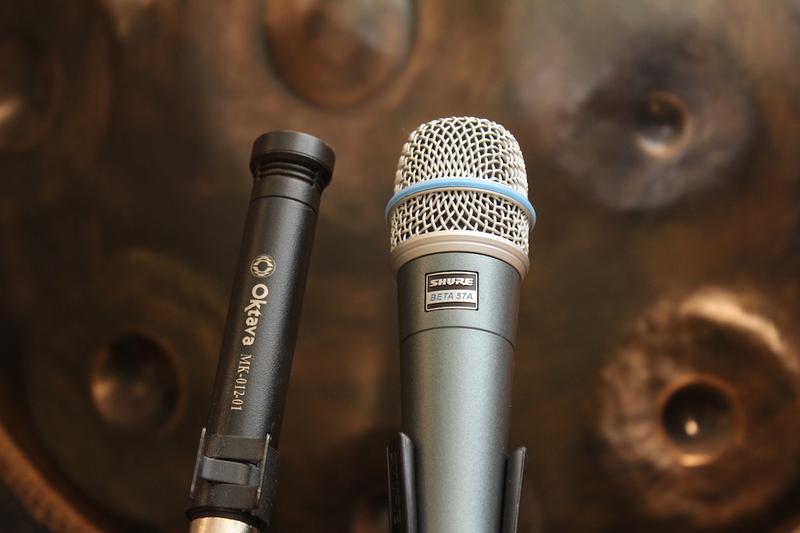 Today, with Jean-Matthieu Bourgeot, we wanted to publish a test between two microphones: Oktava MK012 and Shure Beta 57a. What is the difference in sound quality between the two? This is what we will see and moreover, hear. Beyond written characteristics, let our ear and taste be the judge. Both types of microphones are used simultaneously in a studio environment in order to feel the difference in sound capture. The simplest possible audio chain is used to limit any variables. For several years I have been using, a pair of Oktava MK 012-01 microphones with great satisfaction for recording handpans in studio environment. On the other hand, in a live stage environment I always had trouble using them because of their sensitivity to feedback. This led me to buy a pair of microphones more suitable for use on stage: the Shure Beta 57 A. But will they affect sound quality? This is what we will see in this test. As expected, given the technical characteristics and in particular frequency responses, there is clear difference in audio definition between the two types of microphones. The Oktavas capture more bass and a richer sound overall. However, the Shure still have an excellent quality of sound capture, even if less rich and precise. Pros : Very sensitive, they capture all nuances and subtleties of your playing and can be placed at a distance from the instrument. They faithfully reproduce the tone of your instrument. Cons : Fragile, can saturate quickly, require additional power supply called “48V Power or Phantom Power”. When used on stage, may be sensitive to feedback. Unlike dynamic microphones, they are very sensitive to outside noise (wind, crowd, instruments around) and noises when handling it. Pros : They can undergo high acoustic pressure, meaning they can capture very strong audio source without saturating. They have little sensitivity and are robust. Very low risk of feedback. Small sensitivity to outside noise. Cons : Low sensitivity, therefore must be placed very close to the instrument. They will capture less the subtleties of your playing. And you my friends, what do you think about it?